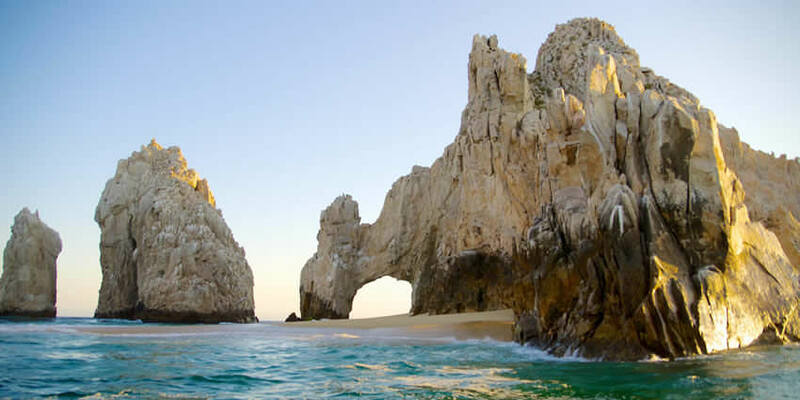 At the tip of the Baja Peninsula stands a craggy rock formation, in the shape of an arch, that towers over the ocean. El Arco is like the gateway to the ocean and has a majestic appearance, reminiscent of another world. The arch has been carved over time, as rough winds and the waters of the Pacific Ocean and the Sea of Cortez erode the rocks away. This part of the Baja Peninsula, also known as Land’s End, is one of the most popular attractions in Cabo San Lucas. Pirates roamed this area in the 1500s, hiding behind the rocky walls, waiting to steal gold from the incoming Spanish ships. See if you can spot sea lions on the rocks. If you come here on a glass-bottom boat cruise, you can also admire the tropical fish that are so abundant in this area. Make it a day trip and visit Playa del Amor (Lover’s Beach), which is a secluded stretch of sand. Snorkel or scuba dive out in the water, or laze on the beach. Stroll along the shore and watch El Arco change color as the sun sets. Between December and March, watch whales as they migrate from the cold Arctic to the warmth of the Baja Peninsula. The shallow, warm water makes the bay the perfect spot for whales to give birth and raise their young. To get to the arch, book a water taxi from the Cabo San Lucas Marina. If you feel fit, rent a kayak from Cabo and paddle to Land’s End instead. Facilities at El Arco are limited, which adds to the quiet, natural feel of the place. Be aware that the currents on the Pacific Ocean side of Land’s End are often too strong for swimming. Lightweight boats, some with glass bottoms, leave Medano beach in Cabo San Lucas, to visit the beaches of Amor and Divorcio (Lover’s Beach and Divorce Beach), located between the Pacific Ocean and the Sea of Cortez, next to the natural landmark El Finisterra (Land’s End).